Don caught mid-roll after being thrown during a demonstration performed on the ground floor in the K-State student union. Head Instructor - Don Eisele - Nidan. Practicing since 1999. Don originally studied under Jack Hayes and Jayne Thompson, and continued under Dan Hayes after they moved away from the Manhattan area. Matthew Ussary - Ikkyu. Practicing since 2006. Tony Kubina - Nikyu. Practicing since 2009. Jen Pratt - Nikyu. Practicing since 2009. Jen throwing Matt and Tony during her last test. 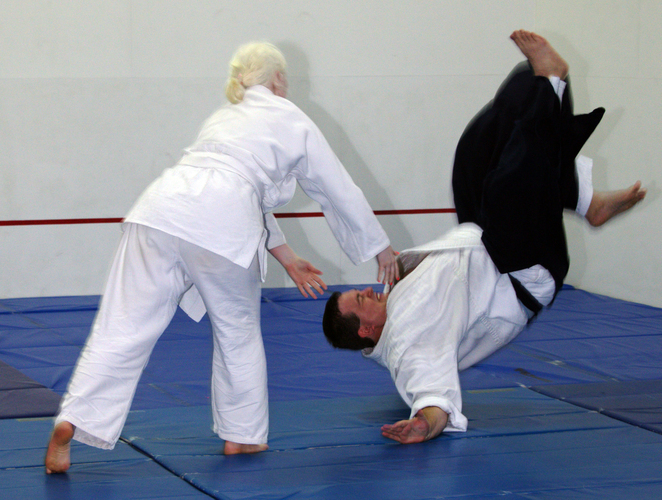 Daniel Hayes serves as Technical Director for Aikido at Kansas State University. Currently he is Sandan (3rd Dan) and Fukushidoin (certified examiner) of the United States Aikido Federation. 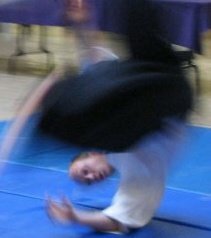 Dan originally studied under Peter Bernath at Florida Aikikai, and continued study with Jack Hayes and Jayne Thompson upon moving to Manhattan. He currently runs Chushin Aikikai in Omaha Nebraska. Please contact Tatsumaki Aikido if you are interested in observing or joining a class. 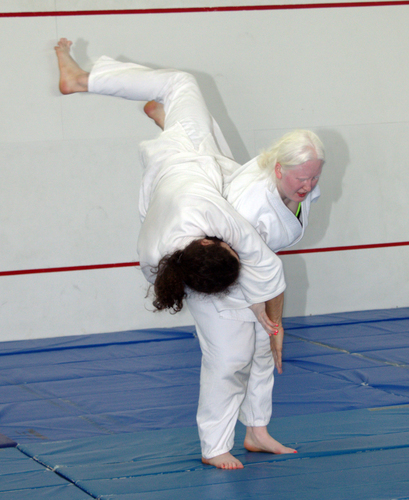 Aikido at Kansas State University is a member of the United States Aikido Federation (USAF), Eastern Region, and the Hombu Dojo in Tokyo, Japan (links at left). The USAF is currently headed by Yoshimitsu Yamada, Chairman of the Board, and a direct student of O Sensei for more than ten years. Yamada Sensei is an 8th dan Shihan, and the chief instructor at the New York Aikikai. For more information on Yamada Sensei or New York Aikikai, please visit http://www.nyaikikai.com.